He may be keeping tight-lipped about what he plans to do next, but Tony Blair has revealed one major regret about his time in power. That he did not do enough to promote the traditional British cup of tea. "If I were running for office again I'd make it a major part of any platform," he joked in a US radio interview. When it was put to him that it was impossible to get a good cup of tea in London, Mr Blair, who stands down next month, said: "I fear you may be right." Mr Blair was speaking about his plans for retirement to Al-Arabiyah television and National Public Radio's Morning Edition at the end of a two-day trip to Washington. He left open the option of establishing a "Blair Foundation" to promote inter-faith understanding and peace. "I'm so busy still being the actual prime minister, I've not worked out exactly how," he told NPR. "All these things are possible. I just don't know at the moment." But he also said he wanted to uphold the British tradition of a well-made cup of tea. As the interview was ending, he was challenged by producer Madhulika Sikka, who said it was impossible to buy a good cup of tea in London any more. "This is a serious allegation," he said. "I fear you may be right. This is a British tradition that must not be lost. If I were running for office again, I'd make it a major part of any platform. "It's got to be properly strong, it's got to have the right colour. "The trouble is, not many people do it like that. "That's why I drink coffee when I'm in mainland Europe, because they just can't make a cup of tea." 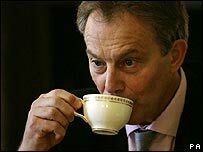 Mr Blair is often seen with a cup or, more often, a mug of tea in his hand - although he has cut down on his coffee intake in recent years following a heart scare.